Aug 12 · Last update 3 mo. ago. Do tariffs and sanctions work? With Donald Trump engaging in a wide range of tariffs and sanctions internationally, what is he trying to accomplish? And can economic sanctions and tariffs even accomplish this? Leaders are increasingly utilising targeted financial sanctions as a tool to weaken the economy of a foreign country, in an effort to address political or social actions the sanctioning state deems immoral. However sanctions can go so far as to destabilise the country’s economy completely, causing inflation, scarcity and large scale poverty in an effort to increase the likelihood of civil uprising and regime change. Used in this way sanctions become a form of economic warfare, and when combined with other measures such as the additional funding of violent rogue groups or propaganda, sanctions appear to be more a device of imperialism or proxy warfare than merely an aggressive economic coercive measure. Trump is just using sanctions and tariffs aggressively to draw public attention to the US trade deficit and away from federal government overspending. Both are something that he rallied to curtail during the run up to the election, but seems eager to boost now that he is in office. Military, infrastructure, social issues, nuclear security, commerce, security and natural disaster suppression have all been allotted an increase in budget spending. As a result the overall budget and previously non-existent vanity projects, such as Trumps proposed Mexican border wall, will cause the federal government spending to rise, something that has been overshadowed by the blame laid at the feet of foreign economies. This however may just be part of Trump’s larger strategy of misinformation, as can be seen too with his aggressive attitudes towards the media, Muslims, and many international deals and foreign nations. Trump’s populism is focusing the public narrative on such issues in a claim of boosting the US’ economy, but he is actually doing the same thing as predecessors, but has just taken on an aggressive demeanour as part of a distracting public relations move. Tariffs and sanctions sometimes get conflated but tariffs are merely taxes on imports by the government of the country importing the goods, whereas sanctions are bans on products, making certain products illegal to import. Even though Trump has instigated tariffs on with China, tariffs do not always amount to a trade war as the result may just be the routing of trade elsewhere for both countries, as it will be cheaper to do so. 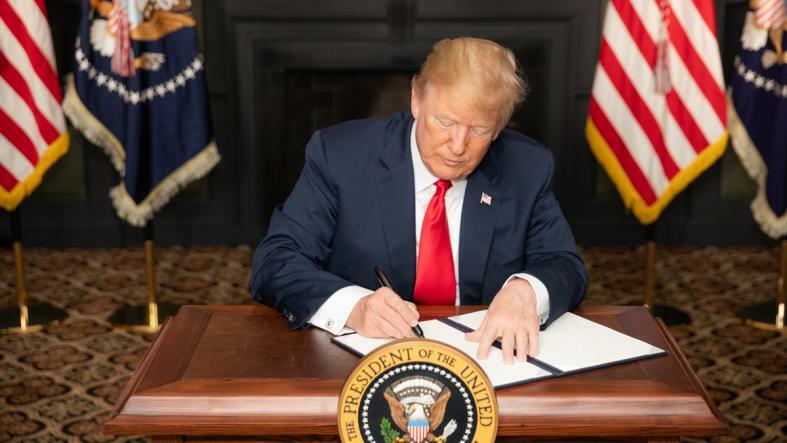 Sanctions however will completely end the trade of certain goods and countries that enjoy a favourable relations with the sanctioning state may also become involved as sanctions can address or target third parties also, for example the US sanctions against Iran. Sanctions work, they are just ineffective with differing studies showing anywhere between a 20-35 percent success rate. As a result sanctions should be used in combination with other diplomatic means to increase the likelihood of success. Smart sanctions should be universal, specific, combined with long term goals, and address the governing bodies of the state they are aimed at. Sanctions are often broken by third party states that do not share the indignation of the sanctioning state and see an opportunity to benefit from the situation financially. This may take the form of open or covert trade with the country, but often involves the sale of controversial products such as weapons for resources. This is the case for example with the recent arrest of Meng Wanzhou, daughter of the founder of Chinese telecom company Hauwei; she has been arrested over Huawei’s alleged breaking of US sanctions against Iran by trading with the country under the covert name “F7”. It is therefore essential that sanctions are universally applied, so that third parties cannot or do not seek to flout sanctions. It has been proposed that sanctions should only be imposed by nations in groups or as part of UN initiatives, to stop other nations defying them so easily. Trump is trying to use tariffs to boost US companies, despite not taking into account that these controls are being applied to intermediate and capital goods, goods that are imported into the US to manufacture into other products. This will likely lead to a higher cost of production, which will only serve to decrease American competitiveness internationally. What is more, retaliatory sanctions imposed on US goods by affected countries will further hurt the US economy. The best, and most well documented example of this is Harley Davidson who plan to move part of their manufacturing process to Europe as a result of Trumps economic policies. Last three years sales are falling 10% of Harley products, as a result of changing tastes in the market and fierce competition from rival manufacturers such as BMW, Honda, Ducati, Kawasaki, Suzuki. This move becomes especially clear when considering Europe and Japan now have a free trade policy, that means all the major Japanese Harley Davidson rivals will have lower production costs, sell cheaper, and be more competitive and therefore have higher sales across Europe. While merely cautioning a country is often ignored and seen as inaction, military solutions are becoming increasingly less popular and more convoluted. Sanctions represent the only viable option in the middle of these two extremes. Economic sanctions are the only way to provide incentives towards reform without resorting to a military intervention. Economic sanctions are used against countries often by banning trade either wholly or with certain exceptions due to ethical concerns, for example regarding food and medicine. These can take the form of oil embargoes, for example the UN’s 1987 voluntary oil-embargo against South Africa in a push to end its apartheid policies. The embargo was supported by 130 nations applying pressure to the South Africa by restricting one of the most ubiquitous commodities that an economy depends on. Sanctions hurt the poorest and least powerful, while the people they are aimed at often just overlook and ignore them, or just use them to turn public opinion against the sanctioning country. Sanctions are often overlooked by third party countries also, who do not share the indignation of the sanctioning country. Depending on what is being sanctioned, these measures can sometimes damage the sanctioning countries economy also. Sanction are still however a go to solution in response to major diplomatic international tensions but their efficacy has often been criticised. Gary Clyde Hufbauer, Jeffrey J. Schott, and Kimberly Ann Elliott published Economic Sanctions Reconsidered in 1985 (with the latest subsequent edition in 2009), an investigation into every sanction that lead to a successful outcome for the sanctioning country from 1914 to 2008. Out of the 200 sanctions studied they could find only 16 lead to the intended outcome, making sanctions look like an unsuitable political tool for complicated international issues.